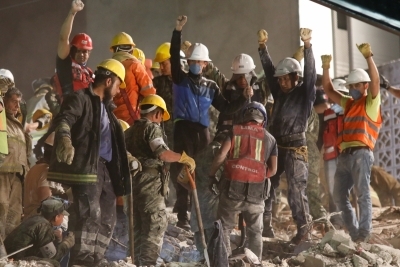 Mexico City, Sep 20 (IANS) Thousands of emergency crews and volunteers raced against time in search of survivors on Wednesday after a powerful 7.1-magnitude earthquake shook Mexico, killing at least 225 people, leaving many trapped under collapsed buildings and forcing people on to the streets for a second time in two weeks. As President Enrique Peña Nieto announced a national emergency, rescuers armed with cutting tools and sniffer dogs in Mexico City continued to scramble to reach survivors of the 2.15 p.m. Tuesday disaster pinned inside the ruins of offices, schools and apartment blocks amid plumes of dust and wailing sirens. Local residents, police and firefighters used their hands to dig through the rubble. Power cuts left much of the capital in darkness. Many people had spent the night outdoors, fearful of aftershocks. Windows buckled and shattered, falling several storeys to the ground while thousands of people streamed on to the streets running away from buildings and potential gas leaks. Mexico City, the country’s capital, was the worst hit. Also battered were the states of Puebla, Guerrero, Oaxaca and Morelos, CNN and Efe news said. The quake’s epicentre was 4.5 km east-northeast of San Juan Raboso and 55 km south-southwest of the city of Puebla. According to the country’s civil protection agency, 94 persons died in Mexico City, 71 in Morelos state, 43 in Puebla, 12 in the State of Mexico, four in Guerrero and one in Oaxaca. It was the second major earthquake to hit Mexico in two weeks and came on the anniversary of the 1985 quake that devastated Mexico City, killing thousands. 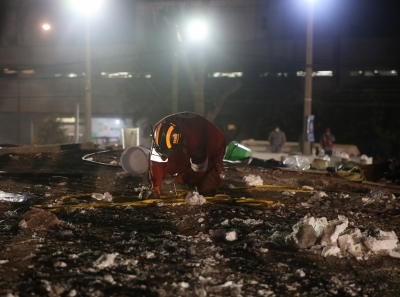 Just hours before the latest quake, many people took part in drills and commemorative events. 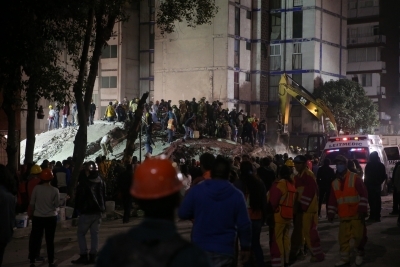 As many as 37 people — 32 children and five adults — died when Enrique Rébsamen primary school collapsed in Mexico City’s southern Coapa district, local media reported. The quake was felt far and wide. In Mexico City, there were power outages and more than 40 buildings collapsed crushing cars and trapping people inside. There was widespread panic, the media reports said. Dozens of buildings collapsed or were severely damaged in densely populated parts of nearby states also. The public transportation system temporarily shut down operations. Nearly five million people were without power early on Wednesday. The President said an emergency had been declared in the affected areas and the military was being drafted in to help with the response. Foreign leaders sent messages of support to Mexico. China extended deep condolences to the victims of the earthquake and expressed heartfelt sympathy to their bereaved families, the Mexican government and people in affected areas, Chinese Foreign Ministry spokesperson Lu Kang said. “China believes that the Mexican people can overcome the disaster and rebuild their lives,” he said.